As one approach to mainstream Eco-Industrial Parks, the Deutsche Gesellschaft für Internationale Zusammenarbeit (GIZ) GmbH, promotes the idea of “Sustainable Industrial Areas” (SIA). Industrial areas are a motor of industrialisation and technology development worldwide. At the same time, they are often criticised as areas of ex­tended resource consumption and environmental pollution. The concept of “Sustainable Industrial Areas (SIA)” answers to this criticism by balancing eco­nomic, ecological and social aspects in industrial areas. This requires in particular management structures, which focus on resource and energy efficiency, environmental protection and social compatibility.The idea of “Sustainable Industrial Area” reflects this orientation and includes social aspects next to organizational, environmental and economical features as an indispensable requirement for a park on its pathway to sustainability. For GIZ the concept of „Sustainable Industrial Areas“ represents an important element of its advice to partners in the industrial sector. For many years, projects addressing various aspects of sustainable industrial development and sustainable industrial areas have been carried out by GIZ in many countries and significant knowhow and experiences have been accumulated in the organisation. The representatives of SIA projects and experts involved have formed the GIZ-working group on Sustainable Industrial Areas (SIA), which, together with its partners worldwide, permanently works on further developing the SIA concept. The GIZ SIA Working Group together with its international partners, have developed a great variety of tools to facilitate SIA. GIZ is experienced in the application of these tools and supports institutions and industrial park managers to be acquainted with best practice find the best suitable solutions and to build effective networks with governments, NGOs and neighbouring communities. 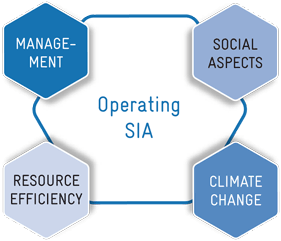 The SIA approach offers through a wide variety of measures and tools, a range of opportunities to improve the environmental performance of individual companies and industrial areas. Each individual area, already existing or newly planned, requires a specific mix of measures and tools. 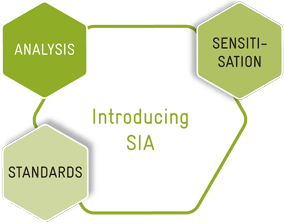 The SIA Toolbox is a compilation of these tools & expertise structured along three major phases and ten thematic subtopics. Those three phases are not meant to reflect clearly definable and sequential stages but underline the different interventions necessary at different moments when providing advice to decision-makers on policy level, administrative authorities, industrial park managers and planners. The Toolbox intends to give an overview of GIZ’s expertise and service offer in the field of sustainable industrial areas and their whole life cycle, and shall guide interested GIZ projects and their partner institutions in the use of the developed tools and materials. When starting to promote sustainable industrial development or to assist industrial areas in their various stages of development, it is important to understand the status quo of industrial areas in the country, such as the management models and the local political, economic, environmental and social framework conditions guiding the national SIA development. This requires for example an analysis/baseline study of the most important aspects and of course formats to raise awareness on different policy levels. A good planning process is one cornerstone of a sustainable industrial area. This applies equally to both, new-planned industrial parks and old ones that need to be retrofitted. 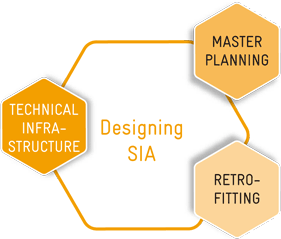 Already during the site selection process and master planning of a new park it is important to create SIA friendly framework conditions. To foster sustainability, a wider approach is necessary which comprises all aspects of infrastructure and logistics, supply of energy, water and goods, collection and treatment of effluents and waste as well as provision of communication networks and social services. For sustainably operated industrial areas it is necessary to assist functioning management structures that help to maintain an open flow of information and the creation of transparent structures within the industrial area, as well as to foster a stakeholder process to reach a high level of acceptance of the residents surrounding the industrial area. Ongoing environmental monitoring and climate risk management ensure smooth production processes and minimize possible negative impacts on environment and local communities.